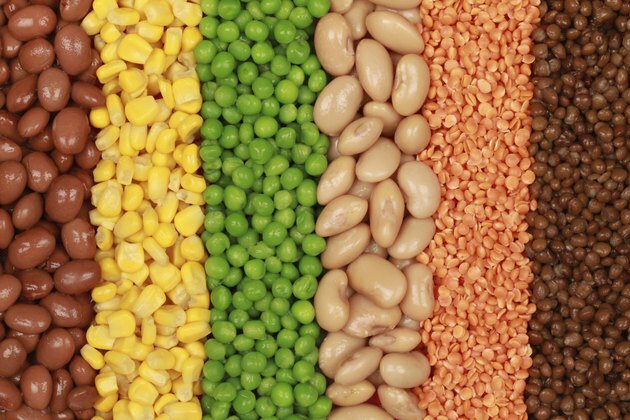 Legumes include beans, lentils and peas, including green split peas. 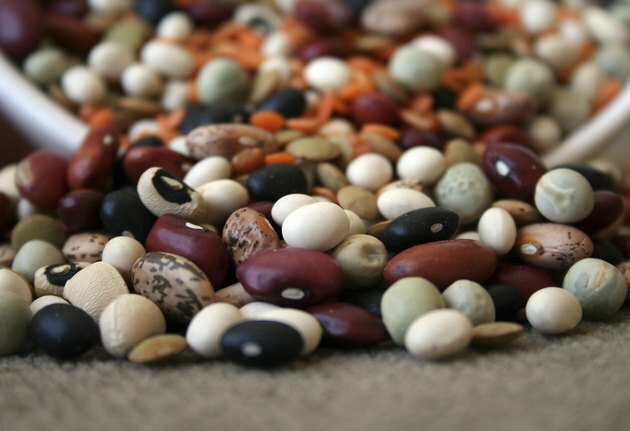 The 2005 Dietary Guidelines from the U.S. Department of Health and Human Services recommend that healthy adults on a 2,000-calorie diet eat about 3 cups of legumes per week. You can use green split peas as a side dish or in soups, and eating them may provide health benefits. People who regularly eat legumes may have a lower risk for diabetes, a disease that occurs when your body can no longer regulate blood sugar levels properly. Legumes may help prevent or manage diabetes because they have low glycemic index, which means they do not cause rapid spikes in your blood sugar. 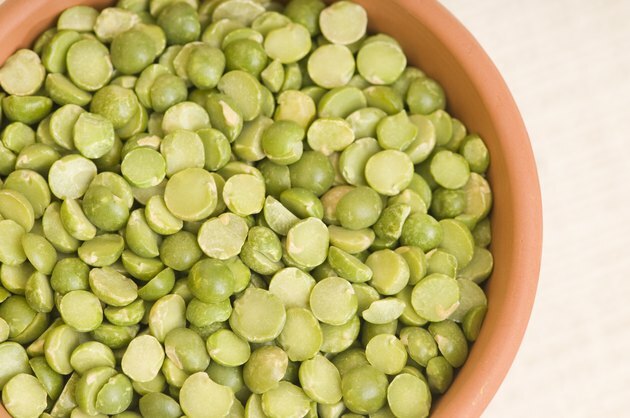 Green split peas have 16.1 grams of dietary fiber per serving. Soluble fiber, such as that in legumes, slows down sugar absorption so it does not get into your bloodstream as quickly. If you have high blood sugar, continue to work with your doctor to control it and prevent complications of diabetes. Eating green split peas may improve your heart health. 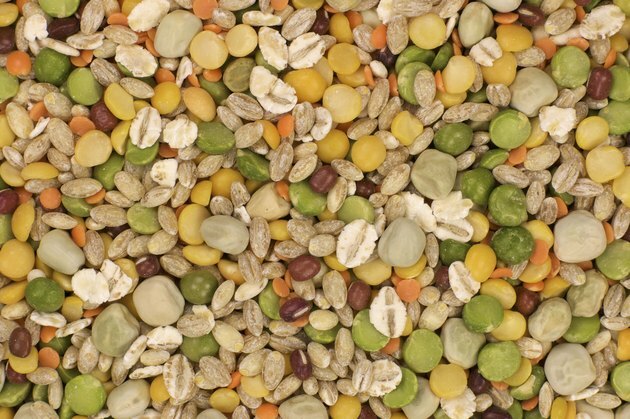 The fiber from split peas may lower your total and bad LDL cholesterol, thus reducing your risk for heart disease. High blood pressure increases your risk for coronary heart disease, and green split peas may help you maintain a healthy blood pressure. The 2005 Dietary Guidelines from the U.S. Department of Agriculture recommend increasing your potassium intake and reducing your sodium, and 1 cup of split peas has about 710 milligrams of potassium and only 4 milligrams of sodium. If you have risk factors for heart disease, talk to your doctor about the best way to treat them. To lose weight, you need to eat fewer calories than you burn. Green split peas may be able to help you lose weight or avoid gaining weight because they are low in calories and they may help you eat less. A 1-cup serving of cooked green split peas has only about 232 calories. A high-fiber diet may promote weight control. Many high-fiber foods, including green split peas, take a long time to chew, so you feel full before you have eaten very many calories. Split peas are good sources of protein, with about 16 grams per cup. The Harvard School of Public Health states that high-protein diets may promote weight control by slowing down digestion and making you less hungry at the next meal.